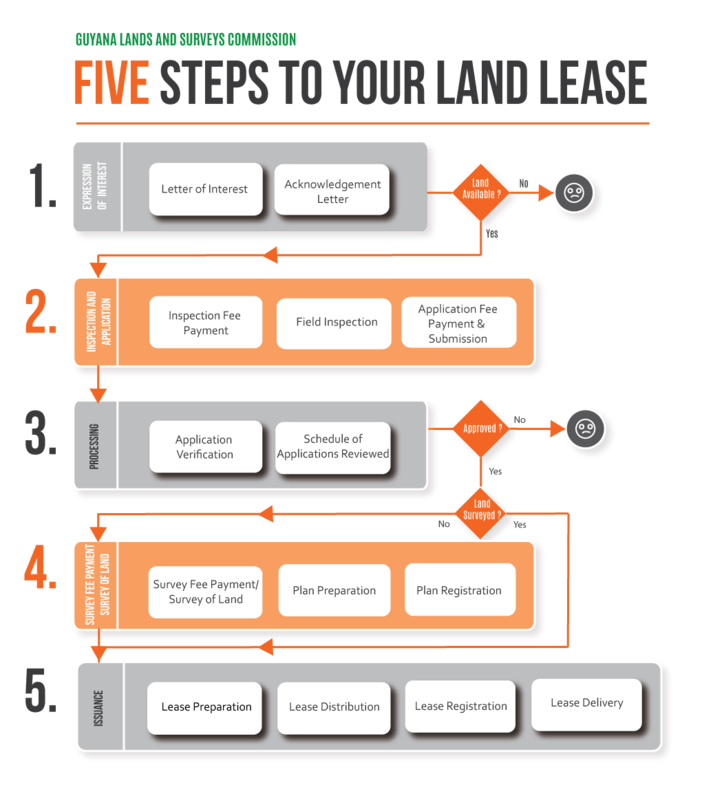 Your application begins with you expressing interest in the need for land. 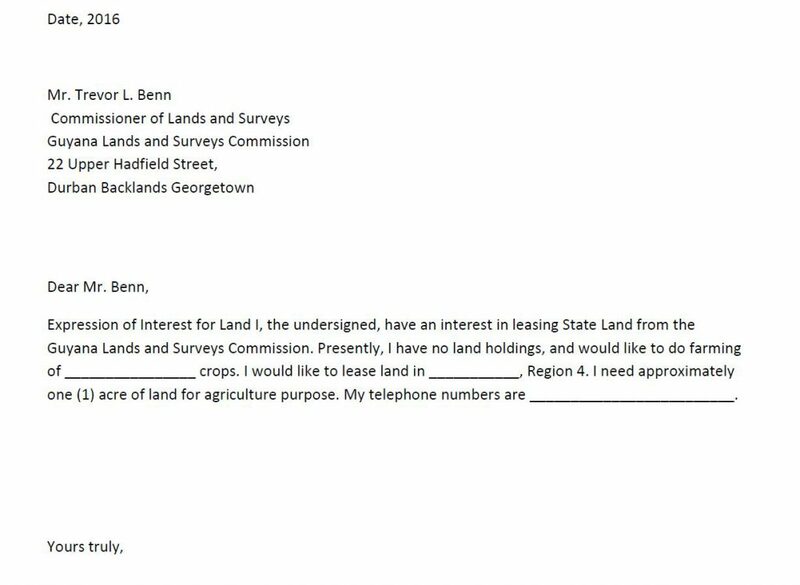 This letter must state the area where the land is located and the total size for which you are applying along with a brief description of the land. The letter is addressed to the Commissioner of the Lands and Surveys Commission..
You will be required to pay an inspection fee. If there is available land within the area for which you have applied. At the same time your inspection will be scheduled at your earliest convenience. On the day of the scheduled inspection, you will accompany the Field Staff to inspect the land for which you have applied. You will be given the option to decide if the land meets your requirements. You will be provided with an inspection report as proof that this inspection occurred. Once the land inspected meets your requirements you will be invited to purchase and submit a formal application. This application will capture details about yourself, the land and your intended use of such. You will also be required to pay an application processing and filing fee upon submission of the application. Your application along with the relevant internal documents are passed to our processing unit to verify its correctness, ensuring your application meets our minimum criteria. Your details are also entered into our electronic database. A detailed list of all submitted and verified applications is reviewed at several levels for approval or refusal. The list of approved applicants is then sent to be scrutinized and signed by the Minister of State within the Ministry of the Presidency. You will be notified of the requirement to conduct a survey (also known as a cadastral survey) if your application has been approved and the land for which you have applied for has not been previously surveyed. You have 4 months to conduct your survey and return the cadastral plan to the Surveys Division of the Guyana Lands & Surveys Commission. The details of your cadastral plan are recorded in our surveys database and stored in our vault. Leases are prepared, assigned a unique number, signed by the Commissioner and recorded in our master register. Long Term Leases are issued to clients whose application would have been approved and requisite cadastral survey carried out so as to properly define and describe the area as per Survey Plan/ Diagram.Leases that are issued now has a 50 years term with a number of stipulations and conditions as called out in the said lease e.g. right of renewal, right to sublet, right to transfer and mortgage, right of lessor to inspect land etc. This is done through an application to mortgage addressed to the commissioner of Guyana Lands and Surveys Commission (application to mortgage forms can be obtained by any GL&SC office). This application can be done at any of the respective branch office for which area falls under. Before permission is issued all fees and rents must be paid up to date or lessee is in compliance with an agreed payment plan. Transfer of leases is a simple process that is allowed under the conditions of a lease. Application for transfer is done at any of the respective branch offices for which area falls. • Surrender Original copy of lease. • A certified copy of valuation report. • Pay inspection fees and 2% duty on current value of land. Transfer will not be done for leases with a remaining period of only one year. In such cases clients will be advised to apply for renewal first or surrender the lease. Renewal of a lease must begin processing not later than 30 days before expiry of the lease.